I recently had a few pints of Bell's Hopslam at The Map Room a few weeks ago. By far, my favorite beer I have had in recent memory. I am not great at describing beer, but it is just so hoppy but juicy and balanced. I know...it is a terrible description. Regardless...I need more of this beer. I recently visited my local Binny's and the manager informed me that this particular brew is always an extremely limited run, only brewed once a year. Apparently Chicago gets a single distribution....and then it is all over until next year, and I just missed the time when it was readily available. Perhaps I mis-understood, but it seems like I might have to wait a whole YEAR to have this again. The Binny's manager assured me that all the Binny's were totally out. Maybe I am just out of luck, but any suggestions would be much appreciated. BTW, I am willing to drive to Wisconsin, depending on how far north it is. Andersonville Wines and Spirits at Clark and Foster still had some today. $17/6 pack, I think. In Fine Spirits might still have some as well, but I haven't checked there. It is only made once a year and is usually gone by mid-February. You could call around to Whole Foods around the area. They often stock a good amount of Bell's and I saw some Hopslam at one a couple weeks ago. Try calling the Green Grocer and West Lakeview Liquors. I think I saw some at the Green Grocer on Friday, but I could easily be misremembering. Darren72 wrote: Try calling...West Lakeview Liquors. This was my first call since I live right down the street. Yep! They said they have about 20 cases still. Anyone try this year's batch yet? Apparently it has been on tap at Sheffields' all week but I haven't stopped by yet. I was fortunate enough to locate some six-packs at Whole Foods though, they are currently chilling at home in my fridge for after work tonight. I'm very interested in buying one of the mini-kegs if I can score one somewhere! Binny's in the south loop is having a firkin tasting tonight. Also, Twin Anchors (who now has a really solid beer selection) will be getting a keg this weekend. I know Lemming's has had it in the past, and i've also seen it at Hackney's Printers row of all places. Probably my favorite beer, especially in draught form. I like this year's well enough -- browsing BeerAdvocate over the past few weeks, you'd think Hopslam was the second coming, though. I mean, it's well balanced for a 10% hop-bomb (it certainly doesn't taste like it's 10% ABV) but I don't think I could have more than 2 glasses at a time. Between the extreme citrus notes and overwhelming sweet taste, Hopslam just overwhelmed and exhausted my palate - I don't know that I really could have tasted/enjoyed much more at a time. I wouldn't mind trying it on tap but I don't know if I could put up with the frothing horde of local beer geeks who I imagine will swarm from bar to bar, drinking kegs dry and leaving over-turned chairs in empty glasses in their wake. I sat down for 2 firkin pours in the Binny's tasting room this evening and enjoyed with a nice aged cheddar and a blue des basques. Really couldn't ask for anything better than that. Picked up a sixer at Woodman's for $14.99. That Binny's went through it super quick, apparently before it even hit the shelves. Picked some up at Whole Foods in the South Loop this morning, 6 pack for $15.99. The cashier said that demand has been through the roof, people coming in and buying several cases at a time. I'm trying it for the first time just now, and it's right up my alley. I love grapefruit and the battle between the honeyed sweetness and hoppy bitterness is beautiful. That said, I really wish it were less than 10%. Flavor-wise I could really drink a lot of these, but at that ABV I don't think I would enjoy more than two...and that's saying something considering how much spirit I can comfortably put away. Andersonville Wine and Spirits has the mini kegs. On tap, Long Room, $6. Good stuff. Always a good place to see who has a beer and how much they're charging. $8 at Longman is pricey, though Liilie's Q seems to take the "most overpriced" contest at $7 for 8oz when most places are $6-7 for 12oz. Thanks to gastro gnome who byo'd a 6-pack, I had some of this last night with some fiery and flavorful Thai food at Aroy Thai and I thought it was a perfect pairing. The strong, distinctive hoppiness stood up magnificently to the couple of dishes I had with it and it added an extra dimension of flavor to the overall eating experience. Great stuff. I bought a 6-pack at Schaefer's in Skokie for about $17 (iirc). They do not, at least as of last night, carry this at In Fine Spirits (neither the bar, nor the shop). ronnie_suburban wrote: I bought a 6-pack at Schaefer's in Skokie for about $17 (iirc). LOL, I've never paid more than $15 for a 6-pack of Schaefer's! 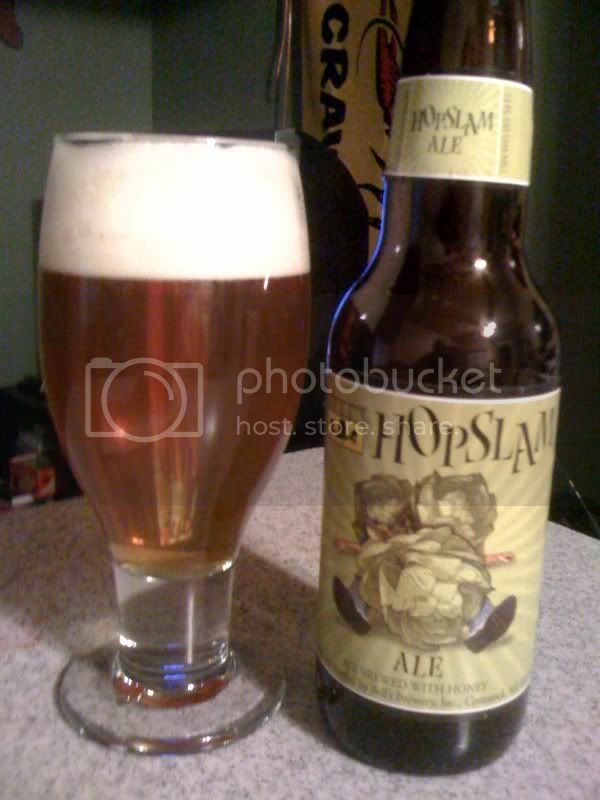 Was at the Hop Leaf last night for dinner and enjoyed a couple half-pints of Hopslam on draft. Fantastic stuff that'll only be available for a limited time on draft. If you want a taste I would head over soon! JeffB wrote: On tap, Long Room, $6. Good stuff. Pretty sure they have a "sliding scale" here. Stopped in last night and was charged $17 for 2 10 or 12 oz pours. However, they did buy the next one so it all worked out. Hmmm. My experience has been consistent with the info on Beermenus. A mistake, possibly. I know how it is, though. Stocks and Blondes, the abysmal Loop bar near the Washington/Wells L gouged me $13 for a shot of Maker's Tuesday night when I sought shelter from the blizzard. PS, the upcharge happened after I had to explain to the goof behind the bar what "neat" means and she angrily tossed the tall, icy glass of watered-down bourbon she'd just poured.